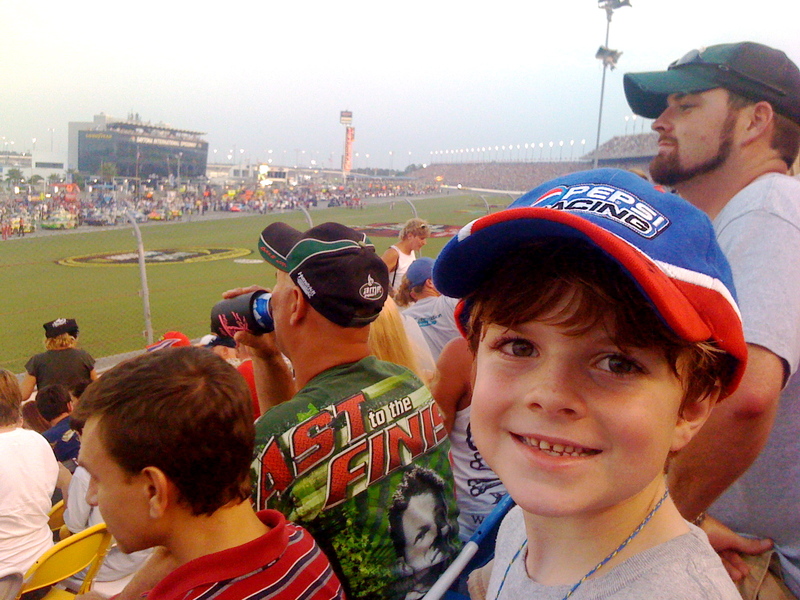 The July 4th Coke Zero 400 at Daytona International Speedway was Caleb’s 6th NASCAR race to attend. 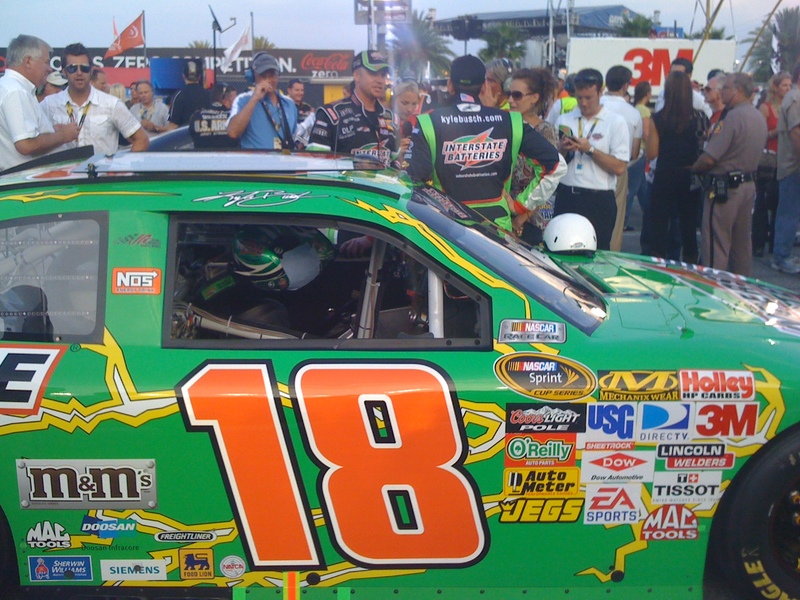 He has been at one Nationwide race (the level below the Sprint Cup), and five Sprint Cup races. All of this may be completely foreign to you. It was to us about two and a half years ago. 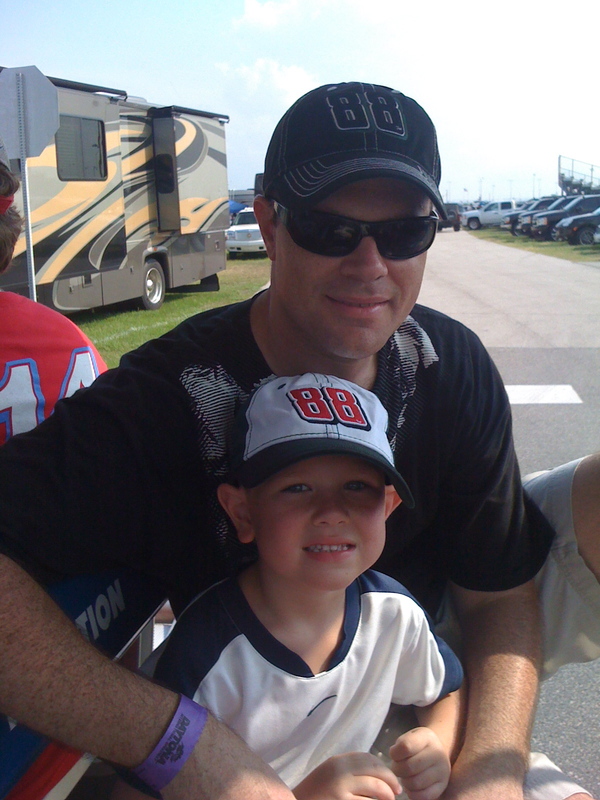 But now, due to Caleb’s passion for the sport and the drivers and the strategy and the creation of various tracks in his room, it is very much a part of our family. Katey and Abby talk about drivers and race with Caleb in his room. Caleb is more knowledgeable about the sport than most commentators on TV. Jen even talks about it. Even about bump-drafting and safety barriers and HANS devices. Those are words that have come our of her mouth. 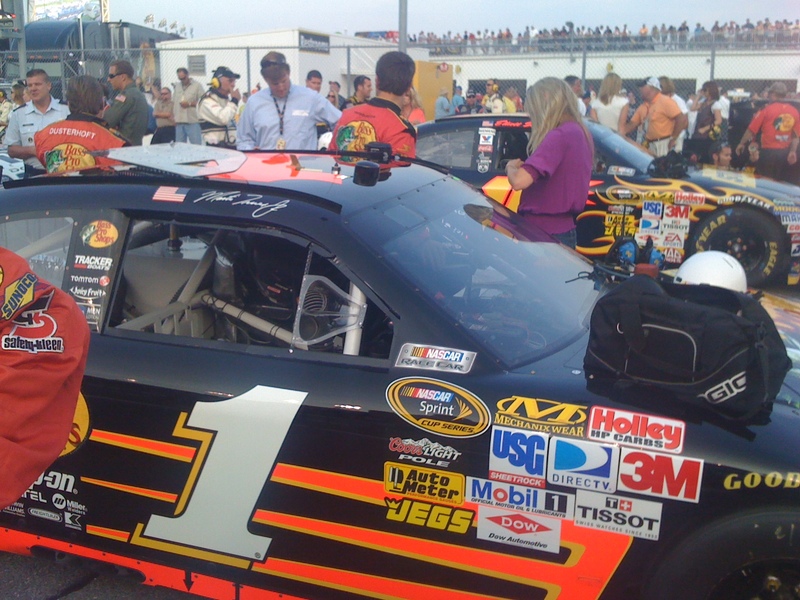 Prior to February 2007, Jen and I both had no idea what a HANS device is. It’s been a fast learning lap and a whole lot of fun. 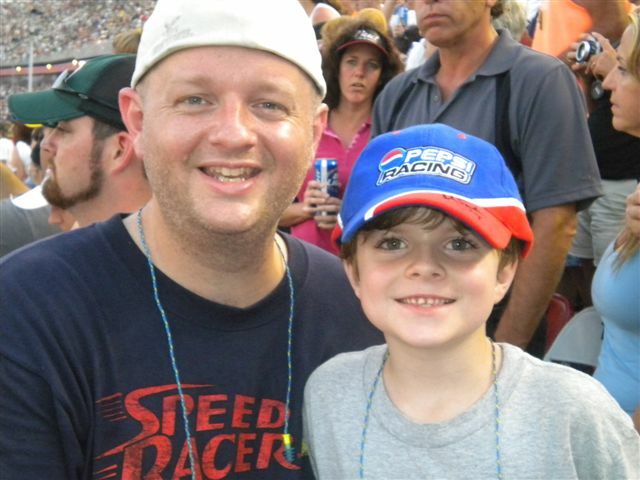 In case you have never been to a race, which I highly recommend, let me give you an audio sample of it. The clip you are about to hear was recorded on my phone. When it begins, the cars are halfway around the track from us. You will hear the announcers for about 15 or more seconds. 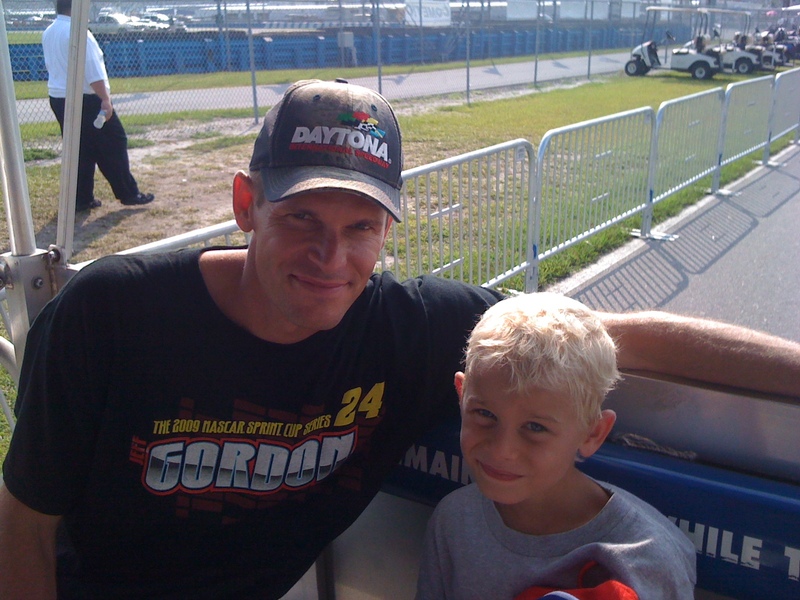 Then, all of a sudden, the roar of forty-three 800 horsepower engines humming by 14 rows below us on the 2.5 mile track that is Daytona International Speedway. 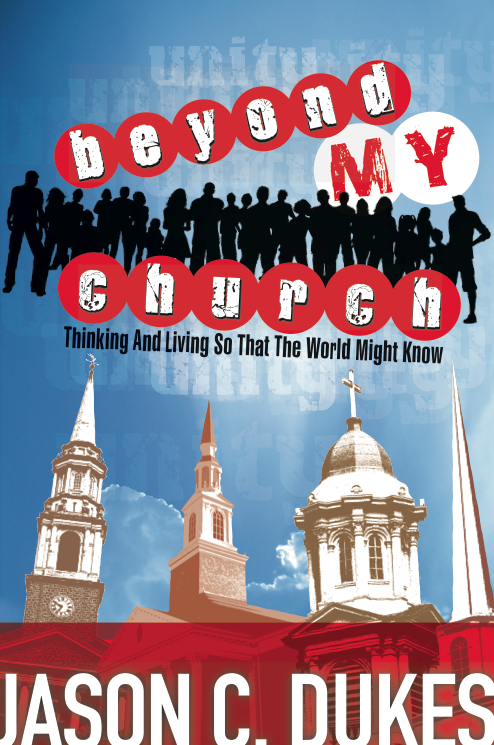 Click the link, then press play. To return to read and see the rest, just hit your back button. 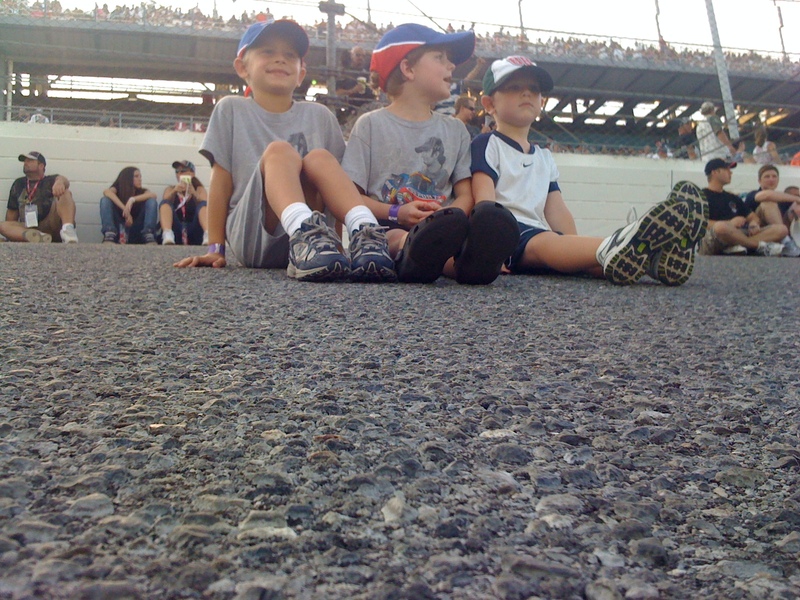 Caleb and his friends Cole and James and their daddies and I went to the race together. It was a blast. 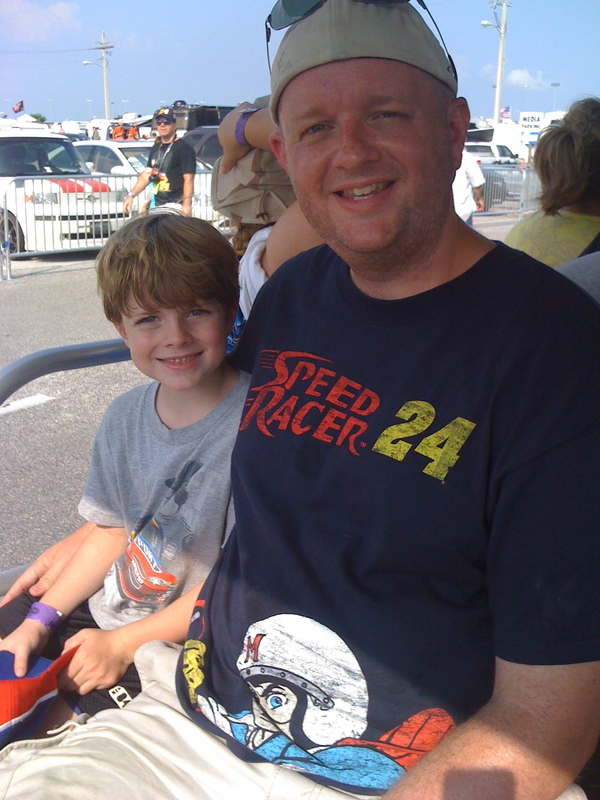 All of us got to hang in the garage area and near pit road and in the infield before the race. The kids absolutely enjoyed it. Our seats were great. Our time together was very memorable. Thanks for a great Saturday Jamie and Chris! Sure do love you guys. 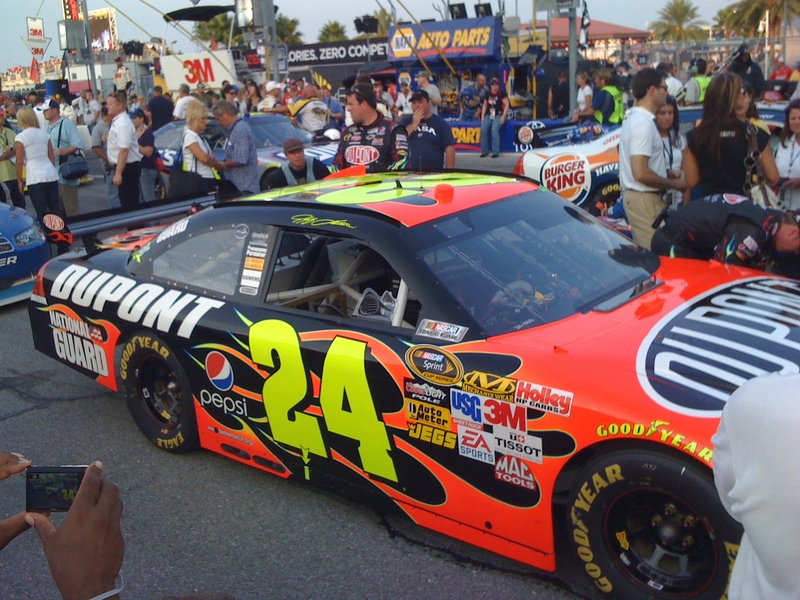 Here are a few pics from this past Saturday night’s race in Daytona. 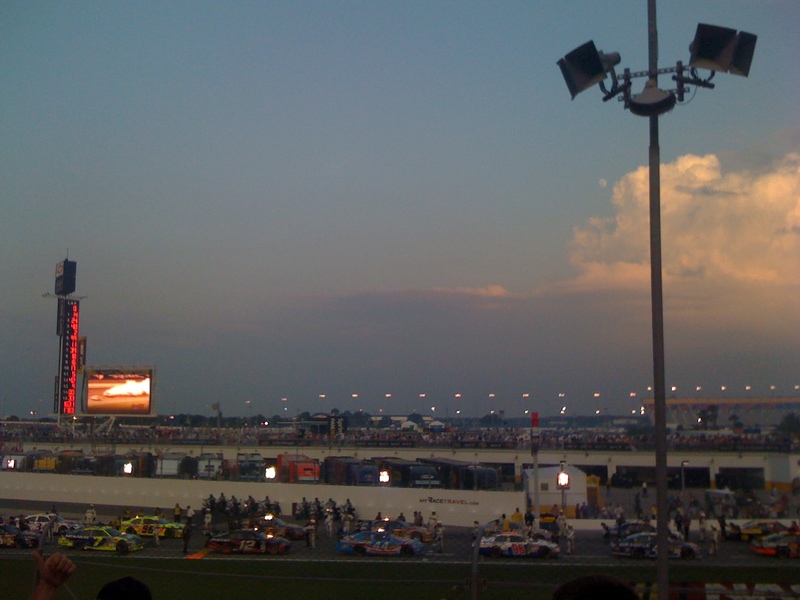 One of which I am really proud of – a panoramic of pit road. 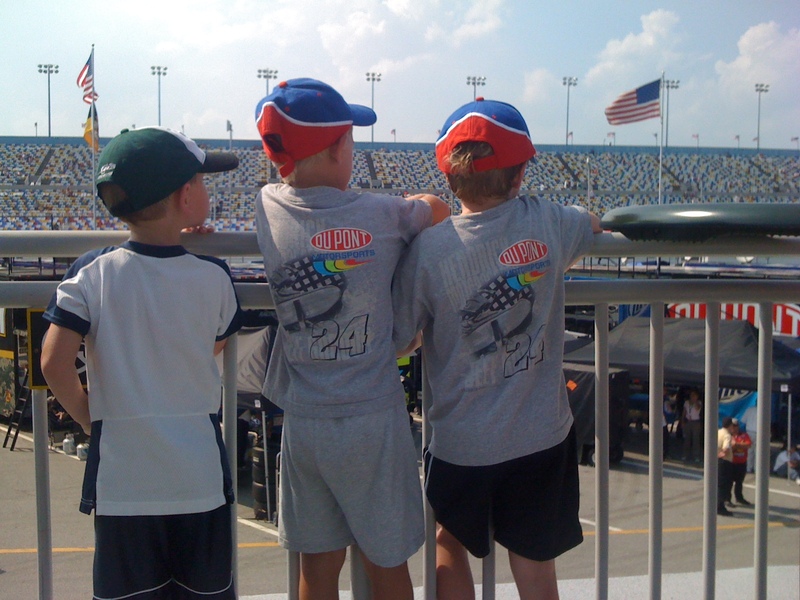 Appropriately, there are 24 (like the #24 driver Caleb loves so much). 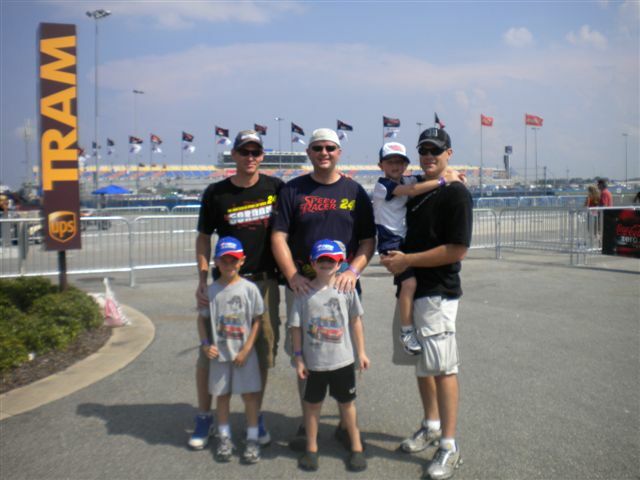 all 6 of us entering “The Fan Zone” in the infield. 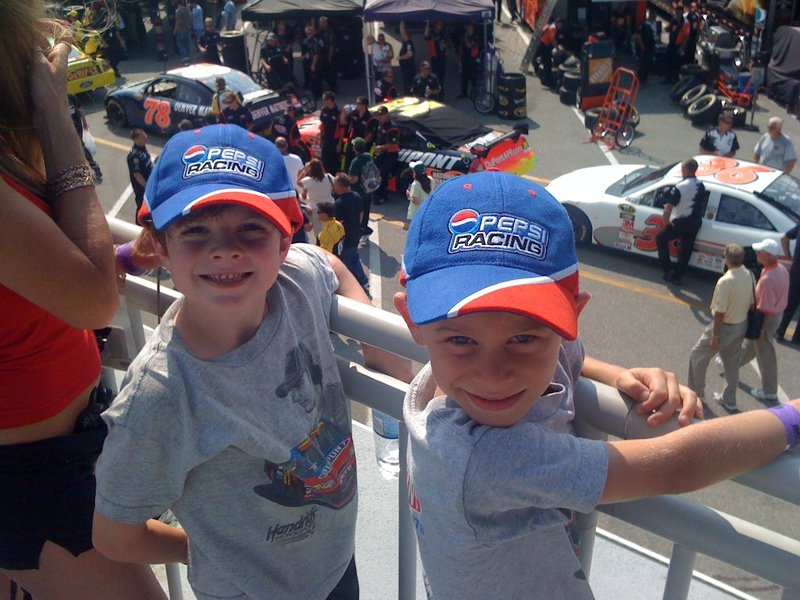 James, Cole, and Caleb from left to right looking down into the garage area. 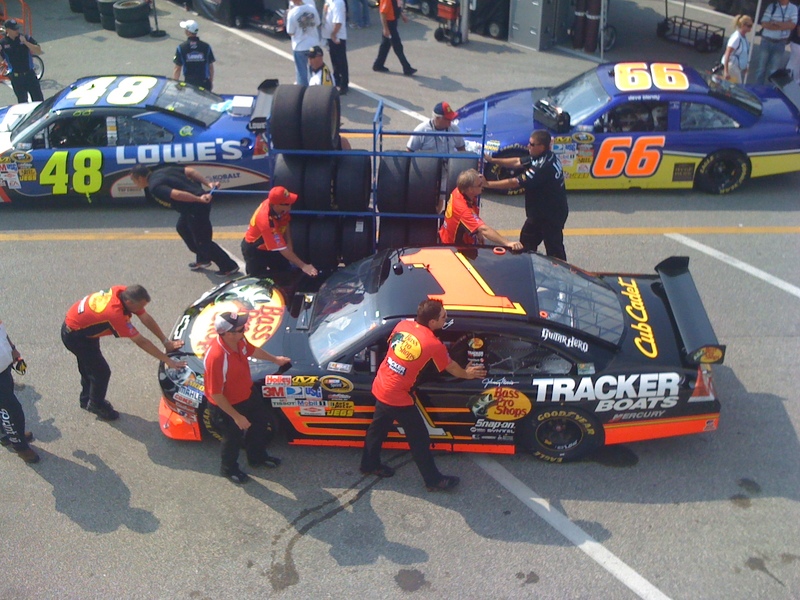 the cars line up for pre-race inspection. 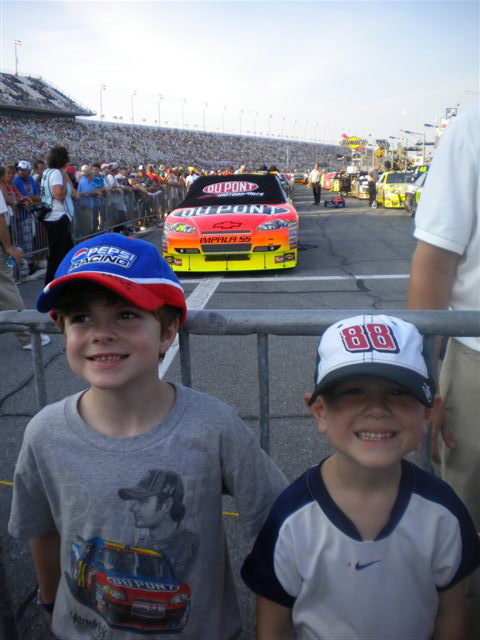 Caleb and Cole with their favorite, Jeff Gordon’s car (#24) in the background. 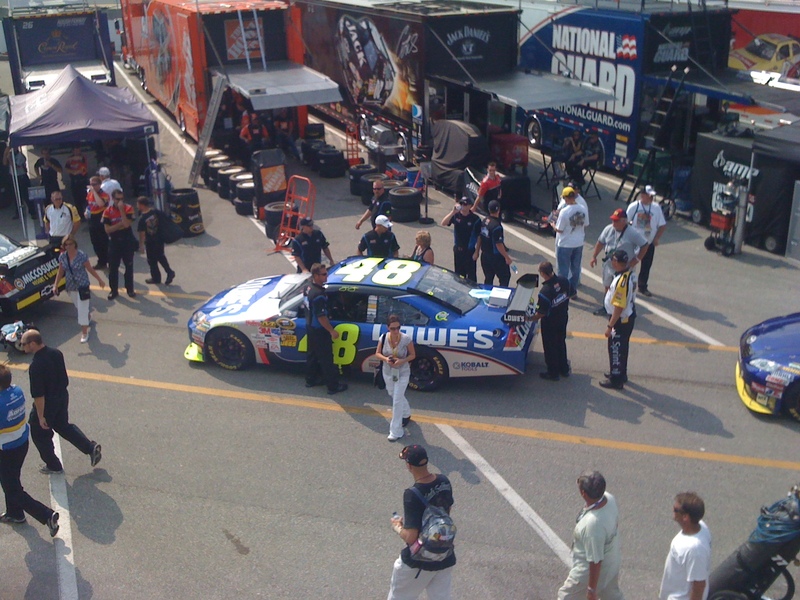 the # 48’s Crew Chief, Chad Knaus (by the 4 on the other side of the car) standing in inspection line. 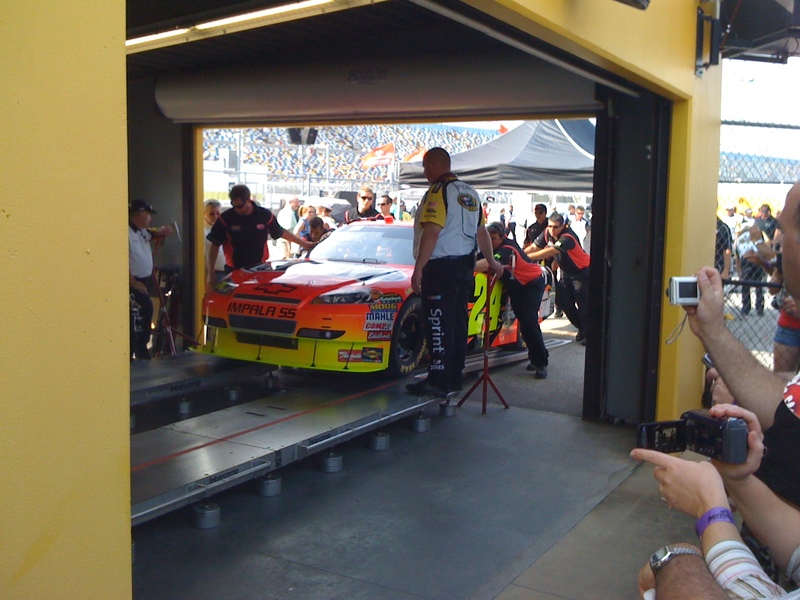 Caleb’s Uncle Jake’s favorite car to watch – Martin Truex, Jr.
the #24 pulls up for inspection. 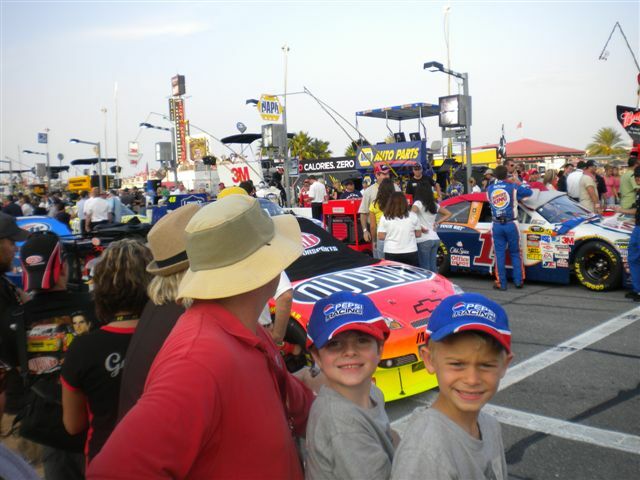 Caleb and James in front of Gordon’s car. 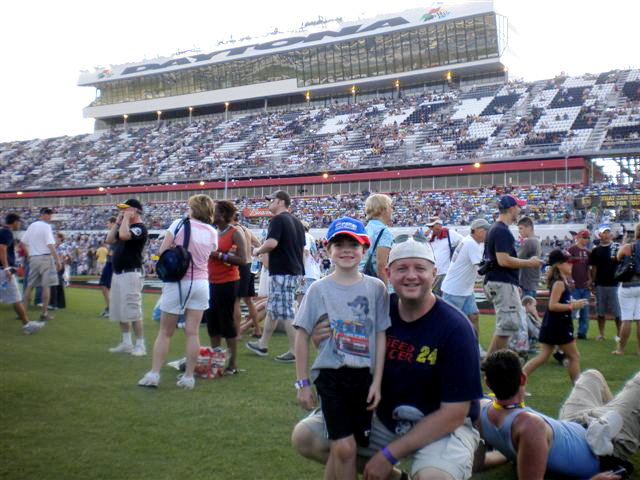 Caleb and me @ the Coke Zero 400.
the three boys sitting on the track before the race. 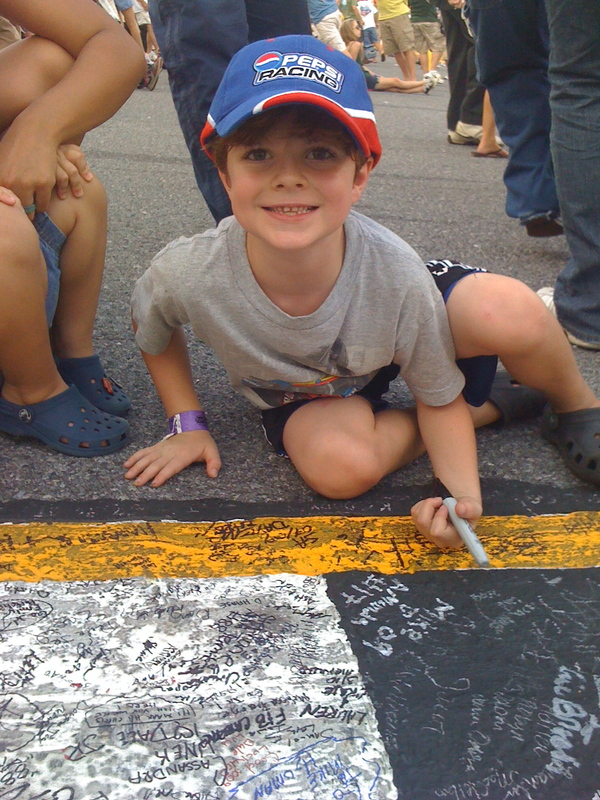 Caleb signing the finish line. waiting for Gordon to walk up to his car. 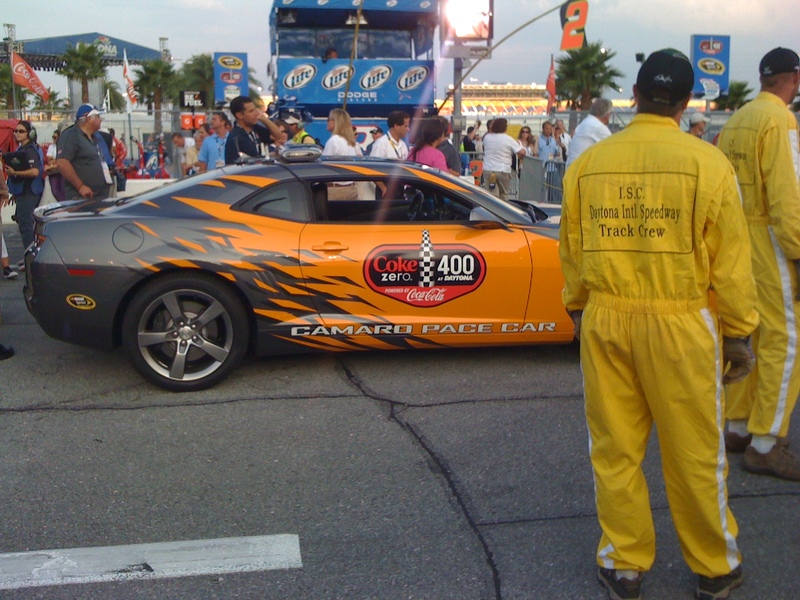 the pace car ready to go!!! 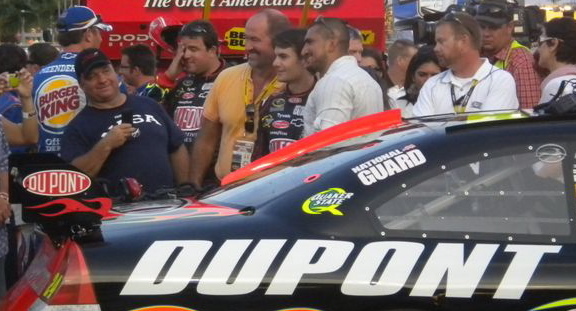 Jeff Gordon, Caleb’s favorite driver (in the middle next to the guy in the white/cream shirt). the leader board tower and a beautiful sunset sky. the view from our seats. 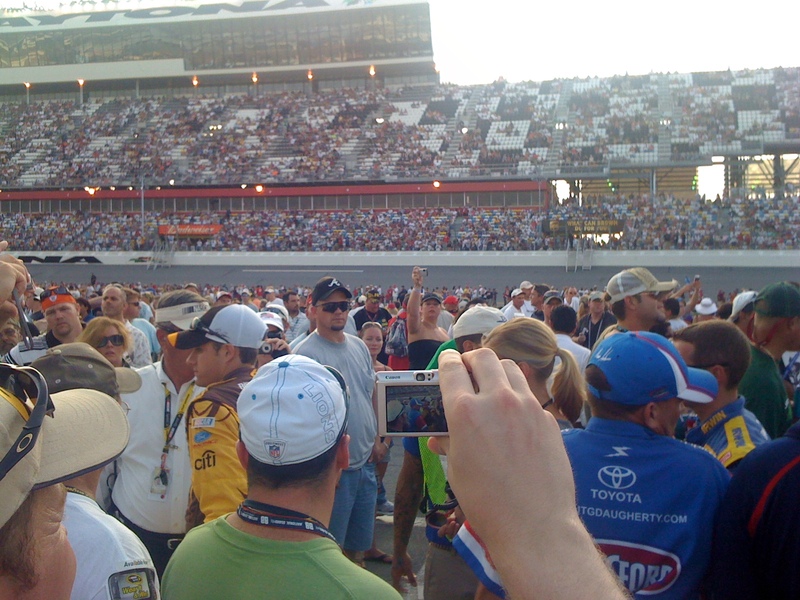 we were 14 rows up looking at the entrance to pit road. I love you, Caleb!!! I am so thankful for you. It’s a blast sharing so much life with you. 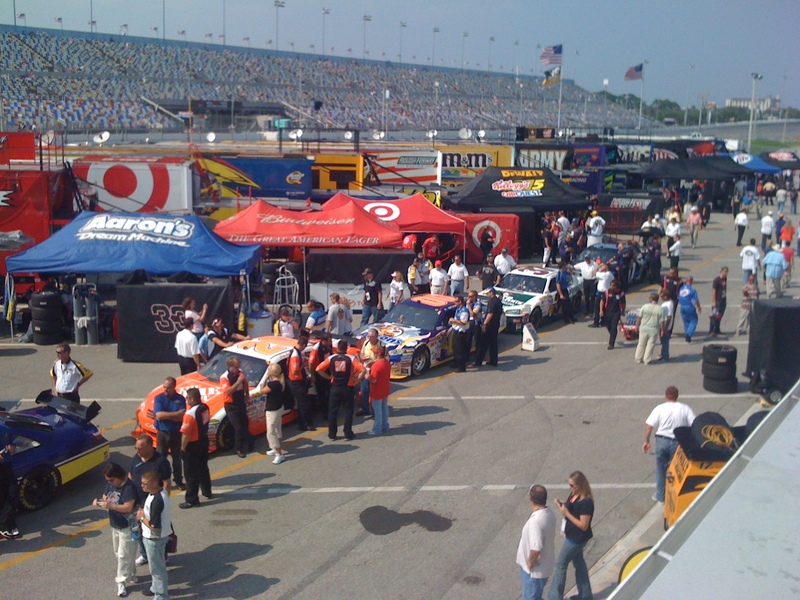 a view from the front of the lineup of the cars on pit road!!! So how did he like the end of the end of the race? Pretty exciting finish. He loved it bro. Awesome stuff.